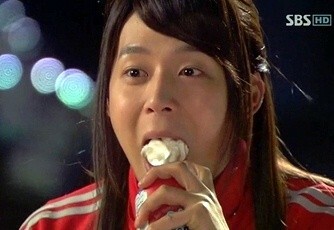 The acting of Park Yoochun and Han Ji Min which very much like real sweet couple has been the envy of netizens. On May 10th, 2012, the official website of SBS’s “Rooftop Prince” published a behind the scene video of refreshing and lively Lee Gak (Park Yoochun) and Park Ha (Han Ji Min) on the scene of a sports games, attracting the attention of netizens. In the video, Park Yoochun and Han Ji Min conducted the filming intimately, as if wife and husband couple. They prepared for the shooting of 2 people with 3 feet sports event. Then, all crew members who were temporary actors appeared, and in the harmonious atmosphere, the ‘lump sugar couple’ Park Yoochun and Han Ji Min also began their 2 persons with 3 feet competition by hanging on the waist and shoulders of each other, showing off the couple-like tacit co-ordination. Netizens said, “They look really beautiful, well matched. Can believe if they’re said to be husband and wife”, “Two people should be in relationship, it’s very good”, “Park Yoochun and Han Ji Min are really a good couple. 4 years of age difference, horoscopes are also very well matched”, “A joyful games! Performance of ‘lump sugar couple’ was outstanding”, “Isn’t Crown Prince said his wish is to have a daughter for real, then join in games with her, have a happy time with sister Park Ha in the drama”, “Very refreshing, lively, pleasant ‘lump sugar couple'” and so on.